I upgraded WordPress this week. Please let me know if anything is wonky. This is an exchange from facebook with names changed to protect the innocent. It highlights something I find happening to me in the library world all the time — having to balance solving the problem with following the rules. The person posting the update needed an article. The rules said they had to pay $31.50 for an article. This didn’t pass the sanity check [“$30 for one article from a journal, that’s crazy!”] and the librarian was grousing. They’re also grousing to a huge network of librarians, many of whom had free [or, paid for by their institution] access to the same content. I saw Nicole speak in Florida this past week and one of the quotes she repeats again and again is “With enough eyeballs, all bugs are shallow” meaning that a particular coding problem that might vex one or two programmers is unlikely to vex, say, a thousand programmers. My Jessamyn corollary to this is “With enough libraries, all content is free.” That is to say… if the world was one big library and we all had interlibrary loan at that library, we could lend anything to anyone. The funding structures of libraries currently mean that in many cases we’re duplicating [and paying for] content that we could be sharing. This is at the heart of a lot of the copyright battles of today and, to my mind, what’s really behind the EBSCO/Gale/vendors. Time Magazine is losing money and not having a good plan for keeping their income level up, decides to offer exclusive contracts to vendors and allows them to bid. EBSCO wins, Gale loses. Any library not using EBSCO loses. Patrons lose and don’t even know they’ve lost. When I was blogging for BoingBoing I often came across content that I didn’t have access to. I was also confronted with, in many cases, unreasonable fees requested [$9.95 for 100 words, really?]. Me being me, I could always find a librarian with access to, say the Times Online archive, or old articles in JSTOR. But I also felt it was cheating. But I was also annoyed that being resourceful is also somehow cheating. And I knew that many of my patrons with fewer resources would just pony up. Where do we draw the line between enforcing other people’s rules and solving problems with our patrons? Now that we’re getting more and more networked, this whole idea of local content works for some things [historical photos, town history] and not for others [journal articles that are held in thousands of libraries worldwide]. Do we have a plan for moving forward? I’m finishing grad school this year, and one of the things I will miss most about being in an academic setting is being able to have easy access to resources. Universities have academic licenses for a lot of things way too expensive in the real world. Also, there is usually someone on campus who has free (and legal) access to what you want, so they can help you out. I think if you are an alumni at my school, you can pay a $25 membership annual fee to the library, so you can still use the online databases, and have access to journal articles. But, not everyone goes to college, and not every college has this option. It’s definitely a significant gap between wealthy/educated people and the rest. How do you help the rest? Among my circle of friends, this is called back-channel ILL. Realisticallly, the requesting librarian could have got the article by placing a formal interlibrary loan request and received it eventually, and for free at the point of need. This sort of interaction just speeds the process up (and breaks the law by distributing the electronic copy rather than printing and faxing it). I have no shame or problem doing back channel ILL. The way the system is rigged (and yes, it is a rigged system, in their favor), it just begs to be circumvented. 31 dollars for one article (the article probably written by an academic librarian, who odds are good, works for a state school, ie is a state employee, ie, paid by our taxes…I am sure we can go on) is simply insane. I am more than happy to do this for any professional brethren of mine. Because in the end, I am all about solving someone’s problem, not worrying over whether EBSCO or whatever pirate du jour gets their pound of flesh (they already got it many times over). ILL may or not have worked in this case (if ILL service charged for instance. Yes, I have had requests on ILL where the other institution wanted money, and the cost was being passed to me. I declined). @arnold: your correction got me thinking – was this a win for “libraries” or “librarians” and can one be removed from the other? I mean, as a librarian, I think it’s just in my nature to help people, and I will do so (and have done) whether I work in a library or not, and I certainly have the compulsion to organize and record. But on my own, I couldn’t afford access to databases like this, nor a very big collection of books. So the librarian has the skills to find and use resources, but it’s the pooled financial resources of a community (in the form of a library) that makes many of those resources possible. So really, I think Jessamyn was right: “With enough libraries, all content is free.” It doesn’t always take a librarian to use library resources; besides, a library win benefits librarians too, and patrons. And on this topic in general: I see nothing wrong with how this went down. If the person had gone to their local librarian, she probably could have gotten the same result. Same-same if a local patron had gone to the librarian who ultimately supplied the article. If a patron from California emails me with a question, I don’t treat it differently from someone who walks up to the reference desk here in Massachusetts – patrons are patrons. When I finally landed my first real librarian job six months ago, I joined some professional mailing lists that are relevant to my role. The practice of requesting and sharing articles is so common on one of these lists, I no longer think of it as cheating or breaking the rules, rather, it’s just how librarians get things done. I say, “Free the content!” If we, as librarians, are service-oriented and disseminators of information, then, we are doing ourselves and our patrons a disservice by charging ridiculous prices for content. I do not feel like it is cheating when I am resourceful and share information to those who are seeking it. And upon re-reading, to be fair I don’t think that everything should be free to everyone forever bla bla, I just think that to patrons of libraries access to content should be as free as we can make it. And that content providers should find way sot give us reasonably priced access to content that we can then share. I know it’s complicated. The State of Vermont has (paid for) access to Gale databases so that anyone in VT who knows they can use these tools, can access the same stuff. Librarians know how it works, we can share it with patrons. This doesn’t solve Time Magazine’s problem, but then again I don’t think people reading magazines in libraries is what caused their problems either. Not to criticize how this worked out, but another option would be to email the author(s). They’re likely have a preprint copy to share (if not the original,) especially if they retained their own copyright. I’ve worked in Serials Acquisitions – back when still in library school – and I’ve seen what vendors charge for access. It is not as if libraries are paying the same rates as individual subscribers. Sure “with enough libraries all content is free” – or at least it is to patrons. Most definitely it is not free for libraries, and as prices increase for subscriptions to electronic access vendors have to expect that people will turn to libraries (and librarians) to gain access. Either way, the vendors are being paid. The only situation I can think of that would be a contract violation would be if a librarian (or other user) downloaded an article from a subscription database or serial and then *sold* it to another person for personal profit. I take issue with the Facebooker who claimed that the journal’s price was evil. It’s their property, not hers. They should be able to charge any price they want, or not even offer it for sale, should they desire. No one is under any moral obligation to surrender their property for any reason. If you want it, buy it. If it’s not for sale, too bad. Thank you for this! There are Livejournal communities of graduate students dedicated to backchannel ILL, which, in the current climate, I wholeheartedly support. The situation with access to expensive electronic journals and databases is a classic case of “to those who already have, more shall be given”: those without stable academic affiliations, on the fringes of the academy, are least likely to have reliable access and not remotely likely to be able to afford subscriptions or outrageous pay-per-view fees. And you know what? Chances that scholars in the humanities and social sciences will ever side with vendors and publishers on this are nil: the content of these databases represents the uncompensated or undercompensated labor of precisely the people who can’t afford to pay individually for access. Just to clarify, if info isn’t free, who decides? Vermont, or one of the other states that has contracted with subscription vendors? 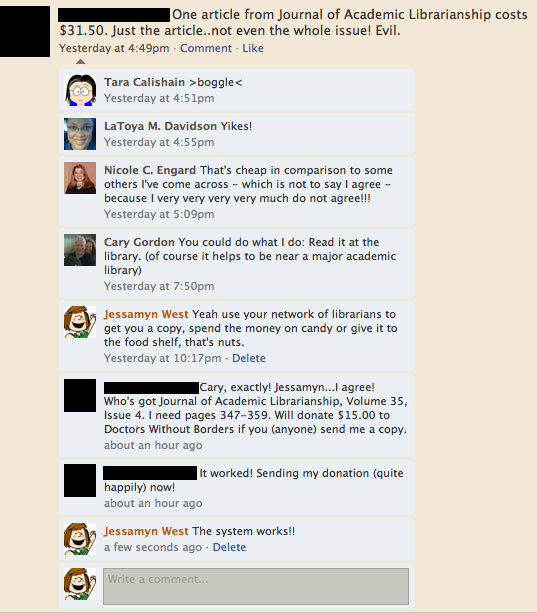 Librarians have not only created the monstrous database costs, we’ve also been responsible for the support and feeding. Mashable content and Creative Commons will be our resources in the future. Contributing, not just distributing will be the solution. What seems especially weird to me is that LIBRARIANS as authors can’t be bothered to put their work where their mouth is. Why agree to make your work hard to obtain while lecturing people in other disciplines that they should go open access? By the way, you can post articles you publish in JAL online and make them accessible, though Elsevier has inconvenience built into their author agreement. Hardly any librarians bother, though. That’s a real disservice to the values of our profession and to our colleagues. It also makes my head hurt. I know when I perform work or contribute something to a project I like to get paid. And then there are things like this, the Code of Ethics that independent info pros subscribe to as a matter of course. “Recognize intellectual property rights.” That’s just up the road from “Don’t be evil” if you get my drift. Most academic libraries have to sign a contract with the vendors (there’s still more than one vendor, right?) that severely limits access to the information. I only wish *any* of my alma maters could let me buy access. I heard once of a professor who shared his password with students & colleagues on another continent so they could access databases provided by his university library. The VP of academic resources immediately labeled him the Global Village Idiot and changed his password. We learn to share in kindergarten but the message we’ve internalized by the time we become professionals is that sharing is wrong. Bummer. My litmus test is, if someone uses the phrase ‘Intellectual Property’ their argument automatically loses all value and is pointless. Much the same as the term ‘Politically correct’. If they can point out how sharing this hurts the author, in concrete real terms, then their argument has some merit. If they can point out how sharing this hurts the author, in concrete real terms, then their argument has some merit. Certainly. If I sneak into a musician’s house and take money of his wallet, this is no different from illegally downloading one of his songs. Both methods take money — property — away from its owner. That’s harm. There’s an entire livejournal community—‘article_request’—whose major purpose is for students and others to request copies of papers that their university doesn’t provide access to…. I am library student who has come the long route to library school and have worked as a cataloguer for regional library system where I would regularly get items interlibrary loan. I could get stuff via the back door of knowing the librarian involved and have been able to work within the rules, but via networking to get my friends and patrons what they needed. It always felt good, but when I moved to a smaller system I missed the power of a union catalogue and end up spending too much at used bookstores. As a publisher and economist, I have to respond — and no one would publish ‘anything’. Or the cost of that publication would be absorbed by institutions and individuals in different way. Publishing and disseminating scholarship has real costs (yes, I know Elsevier has great profits) and they have to be covered somehow. Mostly these are fixed costs and it might be terrific if some august multi-national body (the UN?) covered the cost of all research and publishing, but that’s not the case. & wouldn’t we worry about who controlled what was researched and published in such a world? On the margin giving a copy to someone doesn’t have a cost, that’s why ILL was developed. But the more widely that happens the more the economics of research and publishing deteriorates. If the system can develop a payment mechanism that covers all the real costs of publishing, disseminating, and preserving the results of research in the modern world (electronic) and allows free access to everyone that’s great. Let’s hear your proposals for a real system, not just pride at being pirates. What cost do you think is ‘fair’ for a pay per view article–and what sets that level for you?